Day of the Dead is a giant festival in Oaxaca and surrounding towns. The "official" dates are Oct 31-Nov 2, but you'll find events from Oct 29 through Nov 4. 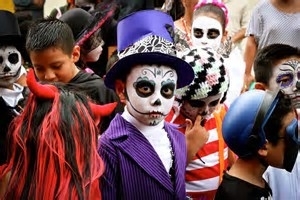 There are many activities, from parades and comparsas to events at cemeteries. Most Mexicans also build an altar in their homes to remember and welcome the ghosts of loved ones that have passed on. The altars are usually decorated with leaves and red and gold flowers, photos of the loved ones as well as their favorite food and drink. Many companies and organizations conduct tours of events and cemeteries in and around Oaxaca. While a tour isn't necessary to experience this holiday, they often include information and places that you may not otherwise experience, especially if you're a first or second-time visitor. We expecially recommend the tours offered by two non-profit organzations: The Oaxaca Lending Library and Fundacion En Via. Contact information for them is listed under the Venues and Tags button. We also post their tours on the calendar in addition to the other events for this holiday.